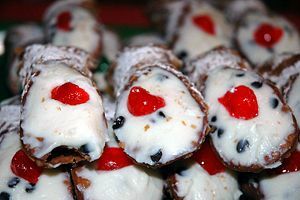 Cannoli (singular cannolo; Sicilian: cannolu) is a famous Italian dessert from Sicily. Cannoli are made of a deep-fried pastry shell, either tubular or horn-shaped, and filled with a creamy ricotta cheese mix sweetened with chocolate and citron. It is usually served with powdered sugar sprinkled on top, and is often accompanied by a cup of espresso. This page was last modified on 27 June 2016, at 18:24.